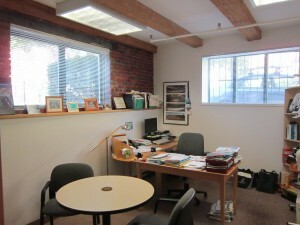 Two private offices are now available at Geek Offices coworking space in Cambrid ge’s Inman Square. Both rent for as low as $950 per month ($950 for 1 person, $150 for each additional person up to a total of 5). One is a 17′ x 20′ (340 sq. ft) space. The other is a 14′ x 12′ (168 sq. ft) corner office shown here. In addition, Geek Offices has 10 open cubicles available in its open floor plan coworking space. Are you part of a non-profit or startup looking for flexible coworking space in the Cambridge-Boston area? If so, check out our private offices and coworking space in the Inman Square neighborhood of Cambridge. Groups and companies looking for shared coworking space in Cambridge and greater Boston will find that Geek Offices provides some of the most affordable coworking space in the region. Geek Offices is a coworking space offering all the amenities of a professional, furnished office, with none of the overhead. Compare Geek Offices to the prices of other startup and incubator spaces in Boston and Cambridge and you’ll be pleasantly surprised by the value our coworking space offers. Geek Offices would like to extend a warm welcome to MuckRock, the newest member at our Inman Square coworking space. The group has has helped reporters and others file more than 10,000 public records requests to government agencies in the past year alone and has released over half a million pages of records. An early Q&A with MuckRock co-founder Michael Morisy can be found here, though our favorite is the group’s FOIA redaction Hall of Shame. Are you a non-profit startup or other company looking for flexible coworking space in the Boston area? If so, check out our co-working space in Cambridge’s Inman Square. Geek Offices is a coworking space offering all the amenities of a professional, furnished office, with none of the overhead. Technology workers and non profit organizations looking for shared office space in Cambridge or Boston will find that Geek Offices provides some of the most affordable coworking space in greater Boston. Compare Geek Offices to the prices and amenities of executive offices and other incubator spaces in Cambridge and Boston and you’ll be surprised by the value our coworking space offers.